CNBTJSA will increase sewer rates 5% effective January 1, 2019. Even with this increase, the Authority believes our sewer rates continue to be a bargain for our customers. The value of clean water cannot be understated. It costs less than $1.50 a day for the average household to dispose of approximately 200 gallons of daily discharge of polluted water. This water is removed from your home, made clean again, and then recycled to our environment. This rate increase is necessary to keep pace with inflationary costs, and to continue to pay for debt service and costs relating to the construction of new facilities. The cost to the average residential homeowner using 15,000 gallons of water per quarter will be about $2 more each month. The Authority continues to be engaged in a series of Capital Improvements Projects in order to remain in compliance with strict environmental regulations, to provide additional system capacity, and to upgrade and improve aging facilities at the treatment plant. These projects come with significant cost and are a primary reason for the rate increase. All Authority projects and expenses must be funded locally, from its users. We receive no financial assistance from either the Federal or State governments. Our mission remains to provide our community and customers with the best and most cost effective sewer service possible, while continuing to strive to achieve perfect compliance with all environmental requirements. Please click here for the new sewer rates. Construction of Phase III of the Authority’s Treatment Plant Expansion and Upgrade Project, which began in May of 2016, is now complete. 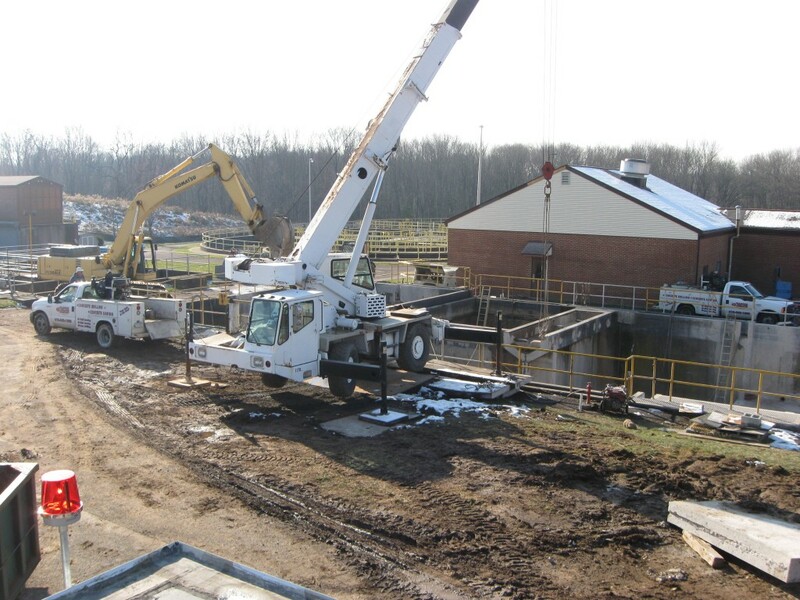 In conjunction with the Phase I and II projects, this project improves the treatment plant’s process capabilities, its operational and energy efficiencies, and provided major maintenance and replacements of various facilities in the plant to help ensure the long term integrity of the treatment plant. LB Industries, of Hellertown, PA, was the General Contractor on the project, and BSI, Inc., of Montgomeryville, PA was the Electrical Contractor. CKS Engineers, Inc., of Doylestown, provided engineering design and construction management. Total cost of the Phase III project was approximately $6.7 million. The combined cost of all 3 phases, which began in 2008, was about $19 million. New Odor Control Units, for both the Main Pumping Station and the Biosolids Dryer. 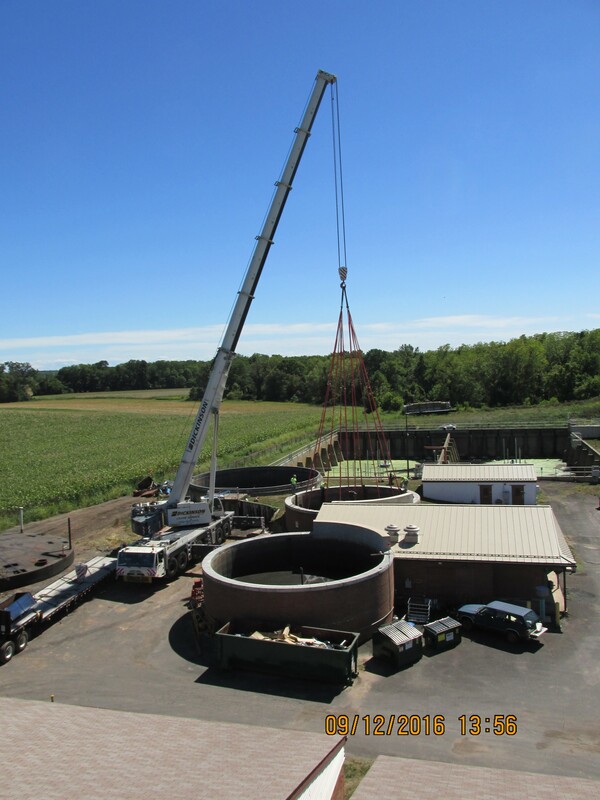 Conversion of Anaerobic Digestors to mixed & aerated Sludge Holding Tanks. Adding a Fine Screen to the final effluent flow. Adding a Biosolids Storage Building, with additional conveyors. Adding a 2nd Generator dedicated to emergency operation of the Main Pumping Station. Replacing the roofing on the older buildings with metal roofs made to last over 50 years. Replacement of sludge collector equipment in the Final Settling Tanks. Replacement of inside and outside lighting throughout the facility with newer, more energy-efficient lighting. Other miscellaneous electrical and mechanical projects throughout the plant site. Please see the “Plant Tour” section of our website for further information on treatment process descriptions and photos. Construction of Phase II of the Authority’s Plant Expansion and Upgrade Projects is now complete. In addition to other related projects, the completion of this project improves the treatment process capabilities, the operational and energy efficiencies, and has increased the facility’s rated treatment capacity from 4.0 million gallons per day to 4.625 million gallons per day, as average daily flow. Total cost of the project was about $7.2 million. C&T Associates, of Souderton, PA, was the General Contractor on the project, and Thomas Controls of East Brunswick, NJ was the Electrical Contractor. 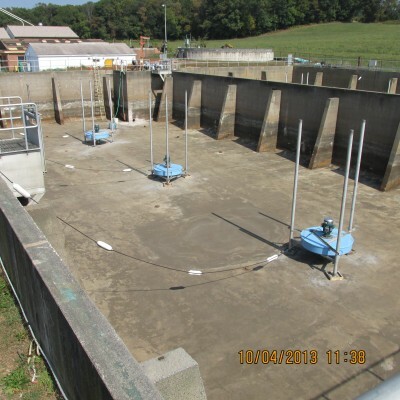 Project design, construction management and inspections were conducted by the Authority’s consulting engineer, CKS Engineering of Doylestown, PA.
Several old chemical feeder systems plant-wide were replaced, and a second 6,000 gallon chemical storage tank was added. Motor controls in the Main Pump Station were replaced for improved operational and energy efficiency. Energy-efficient Variable Frequency Drives (VFD’s) were installed on numerous large motors in the plant, including the Main Pump Station and Oxidation Ditch, improving both operational efficiency and energy efficiency in those areas. Other electrical control and wiring upgrades in various locations. A Supervisory Control and Data Acquisition (SCADA) system was installed throughout the facility. This is a computerized control system that will allow for improved centralized process control and better information management. The Authority’s previous project, Phase I, was completed in May of 2010, at a total cost of $5.99 million. Improvements constructed as part of that project included: construction of a new 95 foot diameter Final Clarifier tank with a peak flow capacity of 10 million gallons per day, and construction of a new Ultraviolet Disinfection System and building. Please click here to see the plant tour. Sewer Authority Board member Joseph T. Bonner was honored at the recent conference of the Pennsylvania Municipal Authorities Association (PMAA) as a recipient of the Extended Service Award for his 30 years of service on the Authority Board. 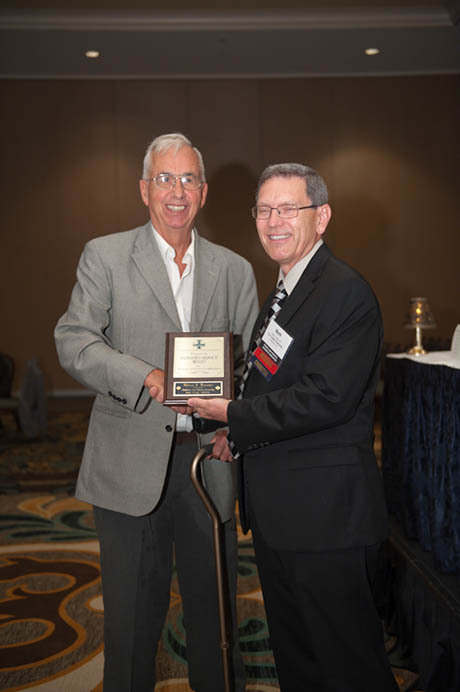 Joe received his award at the annual banquet of the PMAA Conference in August. Joe represents New Britain Township on the Authority Board and has also served as the Board’s Chairman and since 2007. The Authority, and New Britain Township, congratulate Joe, and thank him for his many years of public service to the Authority and the community. On-Line Credit Card Payment is Here! The Chalfont-New Britain Township Joint Sewer Authority is pleased to announce that we now accept credit cards to pay your Sanitary Sewer bill or Tapping Fee. The Sewer Authority staff is proud to report that we are the recipient of the 2012 Excellence Award for Laboratory (less than 2 employees category) from the Eastern Pennsylvania Water Pollution Control Association. The Award was presented at the November 16th Awards Banquet of the EPWPCOA. M.J. Reider Associates sponsored the award. 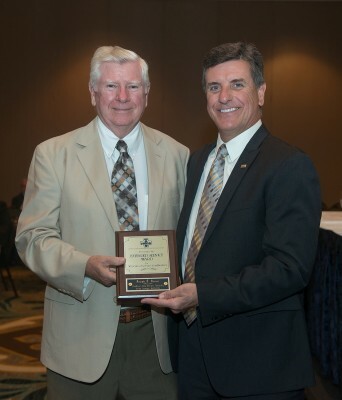 Sewer Authority Board member William H. Rissinger was honored at the recent conference of the Pennsylvania Municipal Authorities Association as a recipient of the PMAA’s Extended Service Award for his 40 years of service on the Authority Board. Bill received his award at the annual banquet of the PMAA Conference. Bill currently serves as the Board’s Vice-Chairman. The Chalfont-New Britain Township Joint Sewage Authority congratulates Bill, and thanks him for his many years of public service to the Authority and the community.